[Solved] Does iCloud Backup Safari History, How to View? FoneLab > Resource > [Solved] Does iCloud Backup Safari History, How to View? “Hi, all! I want to know does iCloud backup Safari history? I need to check whether my son is visiting inappropriate websites or not. By the way, we share the same iCloud account. So how to view safari history from the backup if iCloud does? If it doesn't, is there a way to backup Safari history? Thanks a lot!" Safari history makes it easy to access the website you've visited before. You have 5GB of free storage space for iCloud backup that can be used to back up photos, videos, messages, purchased music, movies, apps, books, TV shows history. To prevent data loss, many people tend to back up their iOS data regularly. Apple misses an useful feature: View the Content on iCould Backup. When you are going to restore certain Safari history from iCloud, you can not be sure if the required items are in the iCloud backup file, or in which backup file they are. Now, let's solve this problem step by step. Not clear enough whether iCloud backs up Safari history? Go to Settings – iCloud on the iPhone or iPad, you will see various contents are displayed under your iCloud account, including Mail, Contacts, Calendars, Reminders, Safari, Notes, etc. Which means all these personal information are contained in the iCloud backup as long as you have enabled them. Besides, it will also keep your device syncing details pertaining to Safari’s saved bookmarks, reading list, favorites, and history folders with other computers and iOS mobile devices that are linked to the same Apple ID/iCloud account. Is there a way to view Safari history from iCloud backup and how? Do you have to restore your iPhone or iPad with the whole iCloud backup since this kind of browsing history is stored in iCloud together with other data, as one part of the iCloud backup? The answer is not necessary. An iPhone backup extractor can help you easily access, view and download the Safari history from an iCloud backup file selectively. You can also restore iPhone contacts, photos, videos, etc from iCloud backup files. 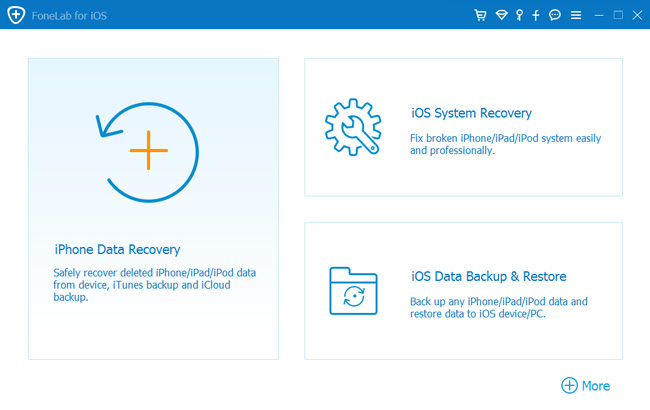 I highly recommend FoneLab iPhone Data Recovery, which is designed to extract existing data or recover lost data from iOS device, iCloud backup and iTunes backup. With this software, you can view iPhone Safari history on iCloud backup and extract them out to your PC or Mac without restoring your device and erasing your data. What's more, you are also able to recover deleted safari history and other iPhone/iPad data within several clicks! Try FoneLab iPhone data recovery to view Safari history on iCloud immediately. Step 1. Download and install the program on your computer, and then launch it on computer. Step 2. Choose iPhone Data Recovery > Recover from iCloud Backup File in the interface. Step 3. Log in your iCloud account, and then choose one backup file and click Download button to start scan. Step 4. Scanning results will be list on the page, then you can view the safari history on the right and check the boxes next to the items you want and click Recover to save them to computer. If you have backed iPhone safari history with iTunes, you are allowed to view safari history through iTunes backup if you want. If you are tired of using iCloud as a backup solution, I suggest that you can use FoneLab iOS Data Backup & Restore, which is capable of selectively backing up iPhone contacts, messages, photos, videos, call history, notes, voicemail, calendars, app data, reminders and restore notes and contacts from the backup to the device. Below is the step-by-step guide to backup Safari history from iOS device to computer. Step 1: Download and install the software on your computer with the above link accordingly. The software will launch automatically once the install process is complete. Choose iOS Data Backup & Restore on the interface then. Step 2: Connect your iPhone to a computer. Then tap Trust on your device home screen if it is the first time connecting to this computer. Step 4. You can choose Encrypted backup if you want to protect your backup files with a password. Or just select Standard backup to move on. Step 5. It allows you to select the type of data you want to backup. If you want to backup all data, just tick the box next to the Select All option on the bottom-left. To backup Safari history, only tick the box in front of Safari History. That's it! The backup file will be saved in the directory that you chose in the previous step. If you have any question about it, please don't hesitate to drop us a comment behind.